71-100: The bandits take 15% of your gil and flee, leaving you for dead. 21-70: The bandit removes a random piece of your equipment and leaves you for dead. This can be recovered by encountering bandits once more and winning. 2-19: The bandits steal 30% of your gil and leave you to the birds. 1: The bandits take your life. 81+: Roll 1d2. 1=Light Shield, 2=Heavy Armor. Roll 1d5. 1=Aetherium, 2=Duralloy, 3=Amber, 4=Garnet, 5=Jasper. 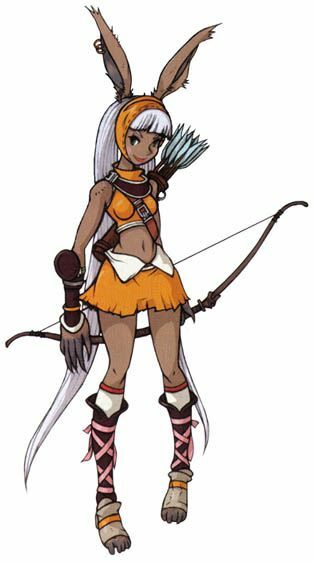 Description: The most common of the races, humes can be found throughout Ivalice. In skill and ability they are perhaps the most balanced race. while they excel in no single area, they perform capably in most any role. 1: Attack(1d350+170) - The paladin strikes with his longsword. 1d3 hits, 15000 damage apiece. 2: Nurse - The paladin restores 10% of max HP for 3 targets. 3: Defense - Chronic 'Defense' status for 1d5 rounds. 4: Cover - The paladin covers for the enemy with the lowest HP remaining. 5: Holy Blade(1d330+160) - A single, powerful holy-elemental sword strike. 25000 holy damage. 81+: Roll 1d2. 1=Staff, 2=Light Armor. Roll 1d5. 1=Aetherium, 2=Duralloy, 3=Amber, 4=Garnet, 5=Jasper. 1: Prominence - 6000 fire damage. 2: Star Cross - 6000 holy damage. 3: Stardust - 7500 non-elemental damage. 4: Deluge - 6000 water damage. 5: Soil Evidence - 6000 earth damage. 6: Wild Tornado - 6000 wind damage. 7: Shadow Rush - 6000 dark damage. 81+: One random Final Fantasy spell under Restorative and Support or Defensive of level 1d4+3. Description: Canine features and long, droopy ears set this race apart. Even-tempered and thoughtful, they possess the capacity for great intellect. 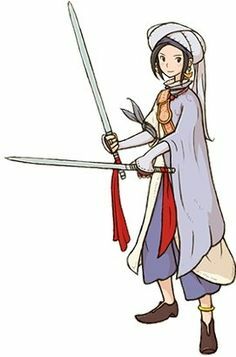 Like moogles, they shun water and avoid it to all cost. Though ill-suited for the front lines of battle, they make incomparable mages and weavers of magick. 1-2: Cura II - 20% Max HP restored for 2 targets. 3: Protectga - 3 targets gain Mild 'Defense' for 1d5 rounds. 4: Shellga - 3 targets gain Moderate 'Defense' for 1d5 rounds. 5: Wall - Target receives Chronic 'Defense' for 1d5 rounds. 6: Raise - Target restored from KO at 25% Max HP. 7-8: Cure III - 20% Max HP restored for 3 targets. 9: Full-Life - Target restored from KO at 100% Max HP. 10: Bravega - 3 targets gain +5000 physical damage for 1d5 rounds. 11: Faithga - 3 targets gain +5000 magic damage for 1d5 rounds. 81+: One random Final Fantasy attack spell of any element or under Status Ailments of level 1d4+3. 1: Fire III - 12000 fire damage to 3 targets. 2: Quake III - 12000 earth damage to 3 targets. 3: Aero III - 12000 wind damage to 3 targets. 4: Water III - 12000 water damage to 3 targets. 5: Shadow III - 12000 shadow damage to 3 targets. 6: Lux III - 12000 light damage to 3 targets. 7: Dia III - 12000 holy damage to 3 targets. 8: Dark III - 12000 dark damage to 3 targets. 9: Ruin III - 12000 non-elemental damage to 3 targets. 10: Osmoga - Steals 1500 MP. 81+: Roll 1d2. 1=Shortbow, 2=Longbow. Roll 1d5. 1=Aetherium, 2=Duralloy, 3=Amber, 4=Garnet, 5=Jasper. Description: Often called the People of the Wood, the viera are a lithe and swift race. Like humes, they can fill a great variety of roles on the battlefield. 1: Quad Arrow(1d360+175) - 1d4 arrows inflict 10,000 damage apiece. 2: Advanced Sweet Shot(1d330+160) - 30,000 damage. 3: Aim: Arm(1d330+160) - 7500 damage & Mild 'Pain' status for 1d5 rounds. 4: Blackout(1d330+160) - 7500 damage & Moderate 'Blind' status for 1d5 rounds. 81+: Shortsword(Rapier). Roll 1d5. 1=Aetherium, 2=Duralloy, 3=Amber, 4=Garnet, 5=Jasper. 1: Rapid Strike(1d340+165) - 1d4 hits of 8000 damage apiece. 2: White Flame - Heals 20000 HP to 3 targets. 3: Fire Whip(1d300+145) - 10000 fire damage & Mild 'Pain' for 1d5 rounds. 4: Shining Air(1d300+145) - 10000 wind damage & Mild 'Blind' for 1d5 rounds. 5: Sliprain(1d300+145) - 10000 water damage & Mild 'Slow' for 1d5 rounds. 6: Heavy Dust(1d300+145) - 10000 earth damage & Mild 'Off-Guard'. 7: Elemental Shift(1d300+145, will resist) - Changes target's elemental weakness. 81+: Roll 1d2. 1=Longsword, 2=War Axe. Roll 1d5. 1=Aetherium, 2=Duralloy, 3=Amber, 4=Garnet, 5=Jasper. Description: Tough scales cover this reptilian race head to toe. Their violent tempers, powerful physique, and love of the battle make them at home on the front lines. 1: Dual Strike(1d340+165) - 1d2 hits of 20,000 damage apiece. 2: Improved Cleave(1d340+165) - 20,000 damage to 3 targets. 3: Tremor(1d330+160) - A powerful blow that sends a target reeling in pain. 25,000 damage & Mild 'Knockback'. 4: Defense - Raises Defender's soak values by 10,000 until next turn. 5: Cover - Covers for a random ally. 6: Mow Down(1d250+120) - A heavy, all-out blow. 30,000 damage to 3 targets. Inflicts Mild 'Slow' on Defender for 1d5 rounds. 81+: Roll 1d2. 1=Greatsword, 2=Battle Axe. Roll 1d5. 1=Aetherium, 2=Duralloy, 3=Amber, 4=Garnet, 5=Jasper. 1-2: Wild Swing(1d300+145) - A wild and wide swing through a group of enemies. 20,000 damage to 3 targets. 3-4: Blitz(1d370+180) - A focused comination of blows. 1d3 hits, 10,000 damage per hit. 5-6: Beatdown(1d300+145) - The gladiator's fury focused upon a single target. 1d3 hits, 20,000 damage per hit. 7: Ultima Sword(1d350+170) - The gladiator's strongest blow. Deals 40,000 damage. Description: This short-statured race is distinguished by the pom poms on their heads and bat-like wings on their backs. They have no love for water, and will not venture in the shallowest of pools. Moogles are accomplished machinists, and they boast a great many unique jobs all their own. 1-2: Rapid Combo(1d350+170) - 1d5 dagger strikes for 5000 damage apiece. 3: Steal Gil(1d320+155): Steals 1d10000 gil from target. 2=One random Final Fantasy spell under Time Magic of level 1d4+3. 1: Slowra - Moderate Slow for 1d5 rounds. 2: Hastera - Moderate Haste for 1d5 rounds. 3: Slow II - 3 targets receive Mild Slow for 1d5 rounds. 4: Haste II - 3 targets receive Mild Haste for 1d5 rounds. 5: Stop - Target unable to move for 1d3 rounds. Cannot act or dodge. 6: Comet - Sends a comet crashing into an enemy. 15,000 damage. 7: Cometra - Sends four comets that target at random. More than one comet can strike the same target. 15,000 damage per hit.